Right-wing protests hit the streets of Caracas and other cities across Venezuela — and in some cases turned violent, attacking police and other targets. 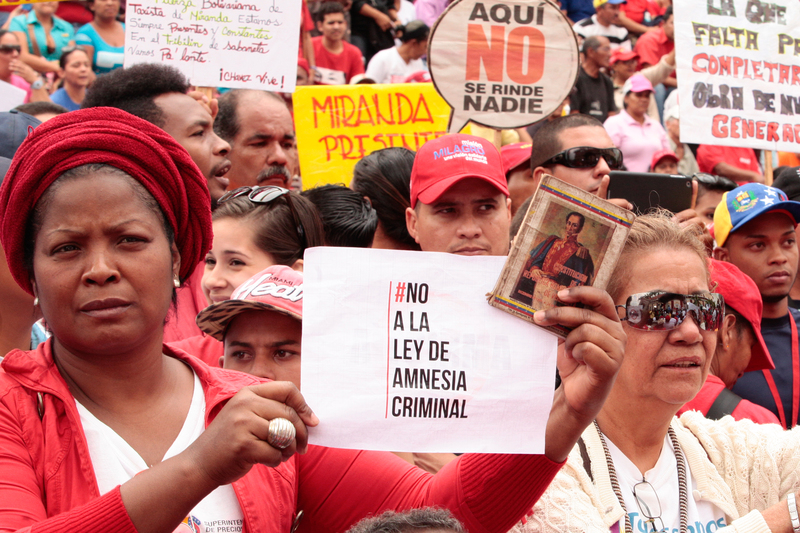 The protests were part of a May 18 national day of action to demand that electoral authorities speed up the process of scheduling a recall referendum against left-wing President Nicolas Maduro. The national mobilisation came after right-wing leader Henrique Capriles gave a press conference on May 17 in which he invoked violence and called for the country's armed forces to “pick a side”. United States President Barack Obama renewed an executive order, first issued a year ago, on March 3 that declares Venezuela “an unusual and extraordinary threat to the national security and foreign policy of the United States”, TeleSUR English said the next day. The order allows the US government to impose sanctions on Venezuela. In protest, Venezuela has withdrawn its charge d'affaires, Maximilian Arvelaez, from the United States, TeleSUR English said on March 9. Venezuelan President Nicolas Maduro announced the creation of a National Productive Corporation on February 22, as part of a new socialist enterprise system aimed at coordinating efforts among existing state, communal and mixed firms. Speaking from the Ana Maria Campo Petrochemical Complex in Zulia state, the socialist leader said the new entity would be tasked with unifying the more than 1000 public enterprises in a “single vision of planning, management, productivity, and maximum efficiency”. The 2016 summit of the Community of Latin American and Caribbean States (CELAC) began on January 26 with the meeting of foreign ministers and chancellors of the Latin American nations at the headquarters of the Union of South American Nations (UNASUR) in Mitad del Mundo, Quito, Ecuador. CELAC, a regional body involving all nations in the Americas except for the United States and Canada, was officially created in Caracas in 2011 under the leadership of then-Venezuelan president Hugo Chavez.